This is a delightful winter holiday punch with pears, cranberries and Sparkling Wine. You can use Champagne, Prosecco, Cava, Crémant or any other type of bubbles you can find—we especially love all the latest Central Coast Sparkling Wine. If you use a drier sparkler, just use less ginger ale. You can also adjust the amount of pear juice to your taste—especially if you like a fresher, crisper libation. On the other hand, many folks prefer a sweeter punch, and pear nectar or soda will pack more punch in that area. PLACE nectar, cinnamon sticks, cloves and cardamom in large saucepan. Bring to a boil. Reduce heat to medium and cook for 5 minutes. REFRIGERATE for 4 hours or until chilled. Remove cinnamon sticks and cloves with slotted spoon. Pour mixture into large punch bowl; stir in ginger ale. Float cranberries on top. This is a delightful winter holiday punch with pears, cranberries and Sparkling Wine. 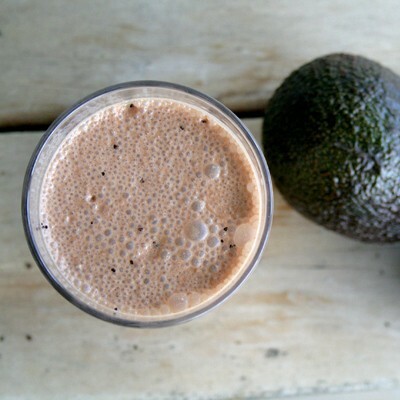 I love healthy smoothies. I don’t know if you’ve noticed, but I’ve been obsessed with mixing up green concoctions for fruit smoothies (or margaritas), and my colleague Chris has been using Natural Bliss to create creamy smoothies as well. They are my favorite thing to drink on a warm summer morning, and also just after a run. It’s a good treat when you want to cut down on ice cream, and using Natural Bliss gives smoothies that creaminess you crave. Our friend Susan of She’s Becoming Doughmesstic created a bunch of delicious, interesting new smoothies using Natural Bliss, and I just can’t get enough! Here are a few of them for you to try. You can find the rest on Meals.com. PLACE acai juice, blueberries, pomegranate juice, spinach, Coffee-mate, sugar and ice in blender; cover. Blend until smooth. PLACE cooled coffee, Coffee-mate, avocado, cocoa, sugar and ice in blender; cover. Blend until smooth. With this roundup of our top 10 New Year’s cocktails + coffee recipes, you’ll be rocking in the new year. With iced coffee, chocolate and cinnamon flavors, this Coffee Abuelatini above is a classy choice for entertaining. Try this Latin-inspired cocktail to add some spice to your New Year. After Midnight Javatini above is terrific for holiday late-night celebrations. A chocolate-rimmed glass and a hint of coffee liqueur add a flavorful twist and a festive flair to this one-of-a-kind beverage. Cloves, cinnamon sticks and anise pods give this Spiced Apple Cider a festive and tasty flair that you will completely love. For an adult party, add an optional splash of vanilla vodka or rum. For some non-alcoholic drink, these Hot Peppermint Mocha Shots add a peppermint kick and hint of coffee to your cocoa for a grown-up version of a childhood favorite. This tasty winter warmer is a rich and decadent party pleaser. 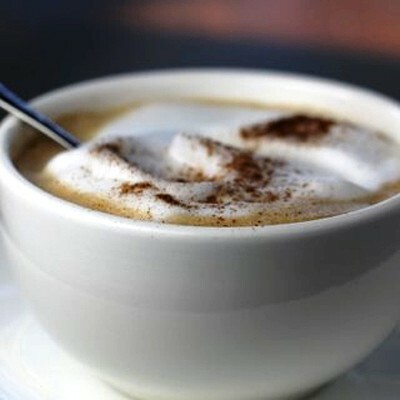 And for a morning-after rouser, try this simple Vanilla Cappuccino above, with a hint of cinnamon. Craving the coffeehouse taste at home? Try the smooth, rich flavor of Coffee-mate Caramel Macchiato, a shot of espresso and steamed milk in this easy Cappuccino recipe. It doesn’t get more delicious. Hot chocolate with coffee and hazelnut liqueurs shown above will warm your soul on a cold night. This elegant Creamy Mint Cocoa is perfect for chilly nights. Add a little Irish crème liqueur to add extra dimension! Top with whipped cream and dusting of cocoa. Hot Buttered White Chocolate Caramel Espresso is rich and flavorful and ready in 5 minutes. This one is perfect for entertaining. Arm Yourself with the Right Tools. If it’s always grill season for you, consider investing in a high-quality grill that can be used year after year. Next, buy a set of flat metal skewers—they do not require soaking and they will not fall apart like the wooden ones. The flat edge keeps food from turning, which is an added bonus. Master the Classics. No barbecue is complete without hamburgers and hot dogs. Toasted buns should be placed butter side down for a few minutes until golden brown. Make handmade patties 3⁄4 of an inch thick and use chopped onions, dry onion-soup mix, Worcestershire sauce, salt and pepper to season. Hot dogs should be turned often until slightly blistered on all sides. For veggie lovers, portobello mushrooms marinated in equal parts olive oil and balsamic vinegar are a tasty alternative. Experiment. Grills are for more than just meat! Pizza, fruits and vegetables gain new appreciation when cooked on an open flame. 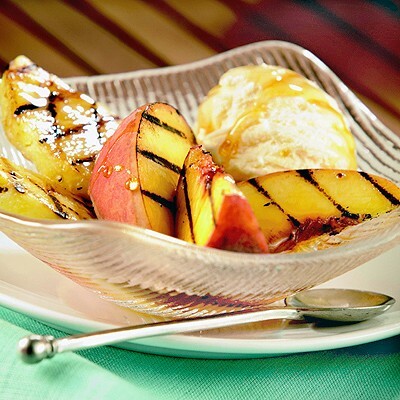 Kids and adults will both love this Grilled Fruit with Apple-Maple Syrup as a summertime treat. Brushed with a warm blend of 100% apple juice and pure maple syrup, this grillable dessert is ideal with a scoop of vanilla ice cream. COMBINE Juicy Juice and syrup in small saucepan over medium heat. Bring to a boil; reduce heat to low and cook for 5 minutes or until slightly thick. Remove from heat and cool slightly. PREHEAT grill. Brush fruit lightly with a small amount of syrup. Grill fruit, brushing occasionally with additional syrup, for about 2 to 3 minutes per side or until nicely browned. REMOVE fruit to individual dishes and top each with a scoop of ice cream. Drizzle with remaining syrup. Here’s a trend I’ve been seeing lately: adding spinach to smoothies, grating zucchini into brownies and stirring pumpkin into soup and pastas. This may sound crazy, but these are all good ways to get more nutrients into our diets, which most of us need! And, they really do taste delicious…or, rather, I should say they don’t taste at all. I can’t even detect the extra veggies added to these particular dishes, so I get to eat my favorite foods with one extra, effortless serving of vegetables. So, I soon became a spinach-smoothie convert, throwing a handful of spinach into any combination of frozen fruit, yogurt and instant breakfast mix I was blending. As May rolled around, I realized I could easily incorporate this trick into one of my favorite cocktails: the frozen margarita! Plus, I love jalapeños and drinks with a bit of spice. Adding a few fresh slices of this hot pepper + spinach gives your frozen margarita some heat, as well as a gorgeous green color. And it still tastes like that awesome beach trip to Mexico. I give you the Green Jalapeño Margarita: your new favorite frozen summery drink. 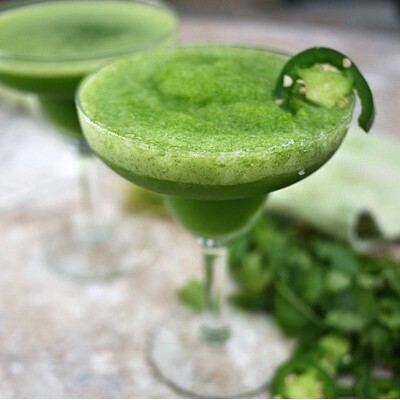 PLACE spinach, Tequila, liqueur, Juicy Juice, lime juice, jalapeño slices, cilantro and ice in blender; cover. Blend until smooth. DIP rims of glasses into water; dip into salt and shake off excess. Pour margarita mixture into glasses. Garnish each with a jalapeño slice, if desired. Cook’s Tip: Increase amounts of jalapeño, cilantro and spinach leaves according to taste. Another option for frozen margaritas is adding whole fruits to the mix, as shown by Better Recipes above. I love oats. They are one of the healthiest foods, and you can enjoy them at breakfast, lunch and dinner. You can also add them to desserts to help make the best part of the meal heartier, crunchier and better for your heart. 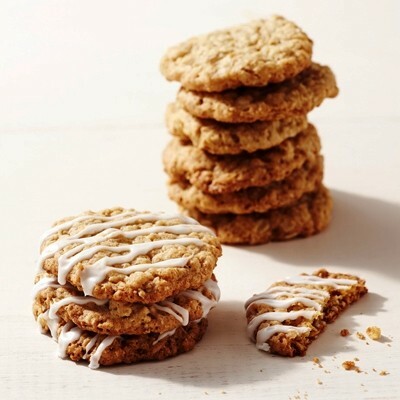 Oatmeal in cookies are my favorite way to make cookies a bit healthier, and icing them using Bliss makes them even more naturally delicious. And if you like a super soft cookie, you can bake them a little less or bake them longer for a more crunchy treat. Enjoy National Oatmeal Month! COMBINE flour, baking powder, baking soda and salt in medium bowl; stir. BEAT butter, granulated sugar and brown sugar in medium mixer bowl at medium-low speed until just combined. Increase speed to medium; continue to beat about 1 minute longer or until light and creamy. Scrape down bowl with rubber spatula. Add egg and 1 tablespoon Coffee-mate; beat on medium-low speed until fully incorporated. With mixer running at low speed, add flour mixture; mix just until incorporated and smooth. With mixer still running on low, gradually add oats; mix until well incorporated. SCOOP dough by level tablespoon, then roll between palms into balls. Place on ungreased baking sheets, spacing them about 2 inches apart. Using fingertips, gently press each dough ball to 3/4-inch thickness. BAKE for 13 to 15 minutes or until golden brown and edges are crisp. Cool for 2 minutes on baking sheets; remove to wire racks to cool completely. COMBINE powdered sugar, remaining 3 tablespoons Coffee-mate and orange peel in medium bowl; stir well. With fork or spoon, drizzle over cookies. Allow glaze to set for 15 minutes before serving. Ever since I bought my new cake stand which doubles as a punch bowl, I’ve been looking for excuses to make punch (or retro layered salad). I fondly remember my mother’s parties when I was young, complete with polyester suits, funny 70s hairstyles and punch for everyone. So I was excited to find this creepy Halloween Punch, Bone Chillin’ Brew, to make for my friends. First task: making ice hands in the freezer overnight. I delegated this task to my friend, who broke one glove, managed to fill and tie the other three properly but laid them in strange locations in the freezer. One hand didn’t freeze all the way through and another had been squished into a corner, its fingers now in a slightly offensive position. That left us with one good ice hand. My ice tip: buy extra gloves and follow the exact directions in the recipe for making the ice hands if you want them to come out right! Cutting the gloves off the hands also takes some patience and skill – not to mention sharp scissors. As I cut off the gloves, two of the fingers broke off the good hand, so I began cutting and peeling more slowly and carefully. I ended up with one good, frozen, dismembered hand. I set to work making the punch. I used part Fruit Punch and part pomegranate juice; I wanted to make it less sweet, pump up the anti-oxidants and make it look more like blood. I also substituted Sparkling Juicy Juice for the soda (it has more fruit servings than soda) and replaced half the soda for pink sparkling wine since this was going to be an adult punch. The punch tasted great with all my substitutions; it was delicious, fruity and refreshing. And it actually looked even creepier with the one dismembered ice hand floating in the bloody-red liquid! 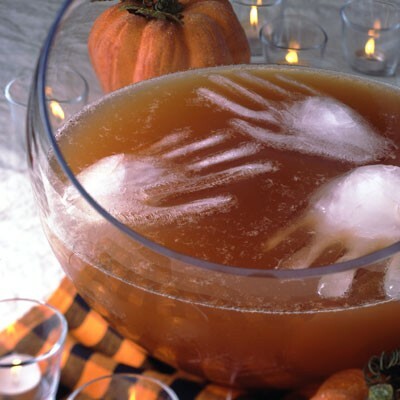 So don’t be scared to try your hand at this Halloween Punch Recipe…you can be terror-ifically creepy too. POUR water into gloves, adding enough water to fill the gloves loosely but not so full that the fingers will not move. Fasten gloves with rubber bands or twist ties. Line baking sheet with paper towels. Place filled gloves on paper towels. Freeze for 3 hours or until firm. COMBINE Juicy Juice and lemonade concentrate in large punch bowl. Gradually stir in soda. Carefully cut gloves off hands with scissors. Float hands in punch. Ever since I bought my new cake stand which doubles as a punch bowl, I've been looking for excuses to make punch. I fondly remember my mother's parties when I was young, complete with polyester suits, funny 70s hairstyles and punch for everyone. So I was excited to find this creepy Halloween Punch, Bone Chillin' Brew, to make for my friends. COMBINE juice and lemonade concentrate in large punch bowl. Gradually stir in soda. Carefully cut gloves off hands with scissors. Float hands in punch.